Our 1 mil polymide tape offers high heat resistance and excellent dielectric strength. The tape removes cleanly without leaving a residue. This 1 mil polyimide tape is ideal for use in electrical insulation, gold leaf mask of printed circuit boards during wave soldering, transformer and capacitor insulation, or simply as a high temperature mask. A suitable alternative to Saint Gobain K250. Other Sizes Available : Please Ask ! Our 3 mil polyimide tape with 1.5 mil silicone adhesive offers high heat resistance and excellent dielectric strength. The tape removes cleanly without leaving a residue. 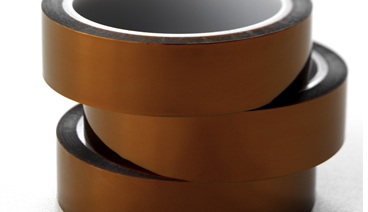 This 3 mil polyimide tape is ideal for use in electrical insulation, wave soldering, transformer and capacitor insulation, or as a high temperature mask when a heavy duty tape is required. A suitable alternative to Saint Gobain 2345-1. Our 5 mil polyimide tape offers high heat resistance and excellent dielectric strength. The tape removes cleanly without leaving a residue. The 5 mil polymide tape is ideal for use in electrical insulation, wave soldering, transformer and capacitor insulation or as a high temperature mask- when a heavy duty tape is required. 3M #5413 1 mil kapton® tape is ideal for masking gold fingers of printed circuit boards during wave solder or solder dip process.